・Three new plants to be built and cracker capacity to be increased by more than 40%. ・The complex will have a production capacity of one million tonnes of olefins and another million tonnes of polyolefins. ・Over 1,500 jobs will be created in the construction phase of the new facilities. ・Sines will enhance its added value by using all current production as feedstock for the new polyolefin plants. ・Repsol YPF consolidates growth in its natural markets in the Iberian Peninsula and Southern Europe and complements its product portfolio. Antonio Brufau, Executive Chairman of Repsol YPF, accompanied by Pedro Fernandez Frial, Executive Director of Downstream, will meet today in Lisbon with the Portuguese Ministry of Economy and Innovation, Manuel Antonio Gomes de Almeida de Pinho, to present the company’s growth project for the Sines Petrochemical Complex in the 2006-2010 period, involving an investment of over EUR600 million. This project contemplates the construction of three new plants, including a power station and two plants for the production of new plastic products (linear polyethylene and polypropylene) at the current installations, as well as increasing the capacity of the cracker currently in operation by more than 40% to 570,000 tonnes/year. Current production at the complex will increase twofold, boosting oleofin production to nearly one million tonnes and polyolefin production to a similar amount. This investment will accomplish full integration of feedstock consumption (ethylene, propylene) at the Sines Complex, and optimise costs, as well as complement the product portfolio and increase production of higher added value products. As a result of all of this, the Sines Complex will increase its efficiency, making it one of the most technologically advanced of its kind in the European petrochemical industry. This project offers high returns since total investment per tonnes of installed polyolefin production (including acquisition costs), represents 60% of the cost required to build a new complex. Following the construction of two new polyolefin plants, the complex will cease to be a mere exporter of raw materials (over 30% of ethylene and 100% of propylene produced at the complex is currently exported outside Portugal), and will significantly enhance its added value by using all the cracker’s ethylene and propylene production in the new polyolefin plants. Linear polyethylene and propylene are plastics with numerous applications and constantly expanding markets. Demand for these products is showing very attractive annual growth rates (6% and 5%, respectively), greatly outpacing the economic growth rates of Western European countries. The linear polyethylene plant will complement the range of products currently manufactured at the company’s facilities in Sines, as well as in the Puertollano and Tarragona complexes, where Repsol YPF is now producing low and high-density polyethylene (LDPE and HDPE). With respect to polypropylene, the future range of products will complement that currently produced at the company’s Puertollano and Tarragona plants, using the most advanced technology currently existing in the market. Repsol YPF is one of the leading industrial groups in Portugal, with a turnover of EUR2.1 billion in 2005. The company is present in several areas of activity in the petroleum chain and has a workforce of over 1,500 employees. In the liquefied petroleum gas (LPG) business, the company operates two bottling plants and enjoys a 20% market share in Portugal. The company’s over 400 service stations flagged under the Repsol brand sell more than 1.1 million cubic metres of oil products and have an 18% market share. Additionally, Repsol YPF sells more than 0.9 million m3 of fuel as direct sales (to distributors), representing 17% of the Portuguese market. Repsol YPF also operates in the aviation business, lubricants, special products, and asphalt segments, in the latter with a 30% market share. In Chemicals, since 30 September 2004 when Repsol YPF acquired the Sines petrochemical complex from Borealis, the company has invested approximately EUR50 million to increase production capacity at the cracker and high-density polyethylene plant and to improve the environmental and safety conditions of this facility. The cracker is a base petrochemical plant that produces basic feedstock, mainly ethylene and propylene, to feed the derivative petrochemical plants, from raw materials produced at the refineries. Polyolefin is a type of plastic divided into two main products: polyethylene and propylene (PP). There are several classes of polyethylene: high density (HDPE), low density (LDPE), and low linear density LLDPE Polyethylene and polypropylene have many applications in different sectors and day-to-day use. Polyethylene is a flexible material, resistant, easy to handle, impermeable, and reusable. Its use is becoming increasingly widespread. Its applications include: film for food products, agriculture and industrial use; water and gas pipes; cables and covering for other materials. Polypropylene is used in textiles (fibres), hygiene and sanitation, construction, household appliances, and toy sectors. It is also used in the manufacture of automobile components, packaging, and piping. The new Petrochemical Complex in Sines will be finalised in 2011, and it is one of the Company’s main worldwide growth projects. Repsol will invest more than 1billion euros, this is one of the biggest investments ever to be realized in Portugal. Production at the new Complex will be mainly destined for export and will exceed more than 1.2 billion euros per year. Around 500 jobs will be created, and during the building process, Repsol will employ more than 1.500 specialists. This project contemplates building three new industrial plants, increasing cracker capacity of up to 570 thousand tons per year permitting a 40% increase in ethylene production. The setting in motion of this Complex, will significantly increase Repsol’s chemical production capacity. The Sines Petrochemical Complex will become one of Europe's most advanced technological centres. Antonio Brufau commented, "This it is a model project that situates Portugal in the vanguard of large European petrochemical complexes”. Today, Repsol's CEO, Antonio Brufau, Portugal's Prime Minister, and Minister of Economy José Socrates and Manuel Pinho, have announced the initiation of the Sines Petrochemical Complex expansion project. This important project is one of company's main worldwide growth projects to be carried out in the Iberian Peninsula and represents an investment of more than 1 billion euros, one of the biggest investments ever to be realized in the history of Portugal. The expansion of the Repsol Sines Complex contemplates building new lineal polyethylene and polypropylene units that will triplicate the current petrochemical complex, and will increase the current cracker capacity by 40%, until reaching a production of 570.000 tons of ethylene a year. In addition, a cogeneration plant of 45 megawatts (Mw) will be built, by this, the Sines Petrochemical Complex will increase its efficiency and become one of Europe's most advanced technological centres. With this important investment, around 500 jobs will be created, and during the building process, more than 1.500 specialists will be employed. The production of this new Complex will be mainly destined for export and will exceed more than 1.2 billion euros per year, which will have a positive impact when exporting petrochemical products from Portugal. The future capacity of the polyethylene and polypropylene factories will be equally 300 Kt/y, while the new cracker production capacity will be 570 Kt/y. The Repsol Sines Petrochemical Complex will end up with a production of almost a million tons of olefins and polyolefin’s. 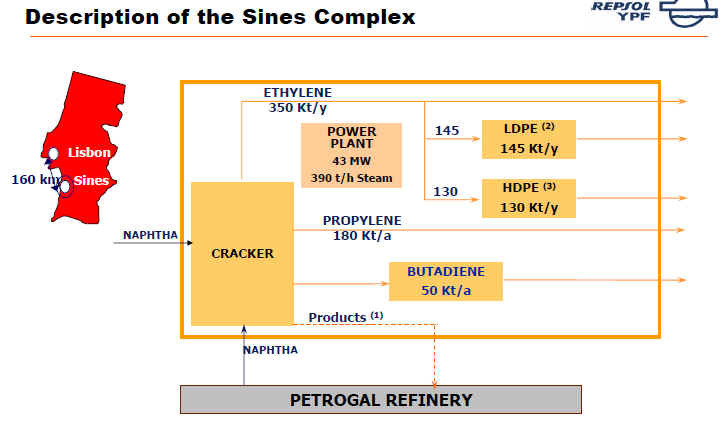 With the new polyethylene and polypropylene factories the Sines complex will no longer be a mere exporter of raw materials, (at the moment, near to 30% of ethylene and 100% of the propylene produced is exported) and it will significantly increase its added value by using the entire ethylene and polypropylene production of the cracker in the new polyolefin factories. Repsol’s CEO, Antonio Brufau, pointed out that: "without a doubt Portugal is one of the high-priority markets for our company, which is made evident by the billion euro investment. Consequently the Sines petrochemical complex is an extremely important project for Repsol which is included in the company’s main worldwide strategic growth projects for the coming years."